First, I just want to note that I don't take many pictures of people while I'm in ministry. Those situations are usually not the time and place to take out a camera. There are times here and there that are better, such as some group activities, and I try to get a photo for the sake of the particular group and event. On my days away in the city, I don't often take out the phone for pictures either, as it can be a "tourist" flag that I want to avoid. However, if I get out in nature, then I often can take some photos. All of this to say that it is best to come and visit if you want to really get the experience! 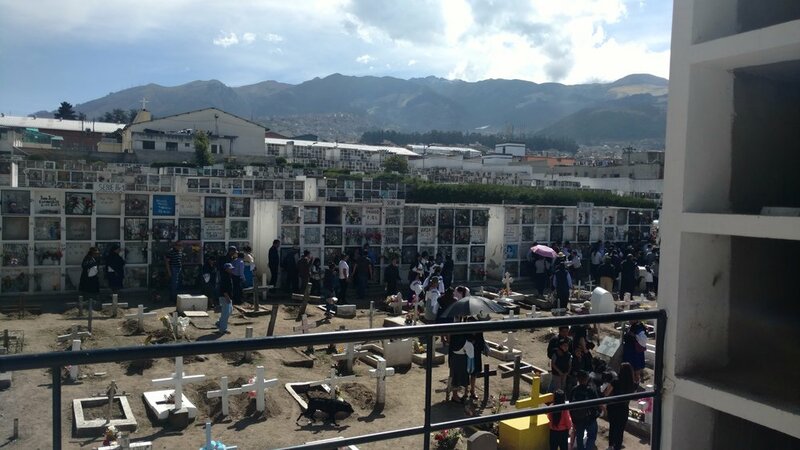 Last week in Quito, I had the special experience of accompanying a family - and their community - in their wake and funeral for a 61-year-old woman. The community is an indigenous community from rural Zuleta in Imbabura, north of Quito. About 10 or 15 years ago many people started to migrate to the edges of Quito from the country, as the rural poverty left them without opportunities. There is always a struggle in societies between the agricultural life and the urban life, and the role of money. In the country, land, produce, and animals have inherent value that is not found in the city, where money is the more common stored value and hired labor drives the money flow. Poorer rural communities feel the difficulty of economically competing with those who utilize resources they can obtain with money in order to get ahead: tools, machines, chemicals, etc. Not to mention that, up until about 50 years ago, most indigenous in Ecuador were essentially slave laborers on large ranches, so they are starting from "behind". Migration of indigenous in Ecuador is a huge thing, and a large percentage of immigrant to the US that come from Ecuador are from indigenous communities, who have historically been oppressed by racism here. A few members of a community migrate, and then more follow along, as the community and "belonging" element is a powerful social force for them. In this case, they were very welcoming to me, and I spent some time in the morning, and then later a longer time in the evening, on the day of the wake. Each time, Sr Rosemary and I would lead a service with music, and I would give a reflection on some scripture. In wakes here, people typically are all seated, and the family is typically busy providing everyone with food. This indigenous community has a tradition of passing the whole night together in the presence of the casket. At some point, they come and sit together in a large circle and then pass the night telling stories and jokes, and ending with certain well wishes for the husband of the deceased. So when I arrived the next morning for the funeral, the place was filled with tired people. The priest came for the quick funeral (he forgot the deceased's name 5 times and left with the collection money! ), and Rosemary had to leave, but I decided to stay. Afterwards, starting with the husband, people started to stand up and share their public sentiments and support for the family. And then, several men took the casket on their shoulders and we all walked down the street to the woman's house, where the casket was briefly brought in. About 15 minutes later, the procession began again, and we walked over a mile and a half under the equatorial sun to reach the cemetery. At times, a car was brought to carry the casket and give the men a rest. But when we got the cemetery, there was some stair climbing to bring the casket up to a higher level. There, with people I had just gotten to know, I was asked to lead a prayer before the casket was placed inside the mortuary-like casing that is common. I won't share what I said, but I had the whole walk to think about it, and i think it was helpful to the people. (There was also a man playing music on a guitar in the cemetery that joined us. That day was during the holiday for the Day of the Dead, where many people come to the cemetery to honor the dead. The woman, Susana, had died two dies earlier, on the very holiday.) After one-by-one people paid their last respects, I was asked to give the final prayer, which is to close the time and send everyone off. At the cemetery, many people are filing out after the burial - a group of about 30 were with us on the upper level, and about 75 more on the ground level. Everyone was invited back to the original location, and there was a small bus hired to bring some people back. Then, a large city public bus came by and took the rest of us back. There, the family had prepared a meal for everyone. It starts first with someone going around to everyone seated, one-by-one, pouring some wine into a small cup to offer each person. (That is how alcohol is typically consumed in Ecuador: you don't get your own bottle or glass or cup - rather, someone is charged with the "source" and a cup, and goes about pouring and offering.) Then came the soda, and afterwards the meal in Styrofoam containers. After everything, people formed a line to give final condolences to the husband, and then left, as the family - who had been serving everyone - took their own time alone to eat together. I was honored to meet new people and accompany them, leading with prayer at the "turning" moments of the day. I got invited to come back and someday visit Zuleta as well. The people struck me as friendly and welcoming. I spent the rest of the day with the sisters, including meals and prayer, and we watched a movie in the evening. The next day, Sunday, I made it to mass at another chapel and later, after eating, did some catching up on errands and other personal things. In the evening, we caught another movie (as Meir is in recovery mode with her cancer, it's a good change of activity). The movie would qualify as a "chick flick", but it had a good message and was relatable to where I was at. While we were watching, some friends stopped by who I hadn't seen in a year, and it was good to catch up. The next morning, after prayer and eating, I packed up and was ready to catch a taxi to the bus terminal. While getting on the bus to Chontal on Monday, I ran into someone I knew from Chontal - we caught up for about 15 minutes of the ride. The ride moves out of the city, passes across the equator, and then climbs the mountains that surround the city. Finally, at one point, the route passes a corner, and a long winding way begins through the mountains, with amazing views. After an hour and a half, we arrive at Nanegalito, and a bunch of high school students board. Gradually they get off until about 45 minutes later, a new batch of students from another school boards. From there, the road becomes unpaved, and it's over an hour along a bouncing, winding path to finally arrive at Chontal. With the students, the whole trip from Quito takes over 3 hours. I'm staying for now in Chontal in the parish house next to the church, on the bottom floor. It has good space, including 2 small bedrooms, a small kitchen and dining space, plus a main space and a good bathroom. The top floor is the parish house where meetings and other activities can be held, These days, the community uses the upstairs space as also the community house, as the old community house is now temporarily being used as school space. Brandon and Samantha are 8 and 11 years old. Nayely wants no part of the photo! I open up the church more while I'm here. I spend time in the morning in prayer each day. On the first day, I was attacked by a horde of children, about 8 years old, who forced me to play with them. First, there was the wolf game, then there was freeze tag, then running races. Along the way, the horde grew. And along the way there were fights between the kids, so I would be the lead peacemaker between the two combatants. The other kids joined in, too, until forgiveness was asked and then given. Then, like my old basketball coach days, I had everyone put our hands in together, until after a 1-2-3, we all would cheer, "amigos". At one point while we had recessed to the side of the field, little Oscar was spitting blood in his saliva: he had lost his very-loose tooth during some of the rough play. I asked him where he lost it, and he pointed out into the middle of the field. So, we all went out to the spot and got on our knees in the grass. Within 5 seconds maximum, one of the little girls pulled it out of the ground. Then, we all marched to Oscar's house, to bring it to his mother, since his mouth was bloody. It was the funniest thing! We got there, and I bought some water for everyone, and after cleaning up, we all went back. The kids wouldn't let me go! After a few more peacemaking interventions and amigos cheers, they saw the church nearby, with the doors wide open. They said, let's go pray! So, they all grabbed me and we went into the church. Each one got to ask something of God from their heart. Of course, there was one girl who was wild like crazy - as always - so we finally left. There was another intervention and another putting hands together for an amigos cheer. Of course I enjoyed it all, but it was time to end. After 2 hours, I was tired! I include that story with a little more detail as an example of what mission is for me. To "waste" time playing with kids can seem a bit insane. But then, by entering into their world to be with them, that is the first step in following the Son of God who did the same for us. In all the play and the wasted time being "amigos", kids get an organic experience of example for the experience of lived life, for the experience of what to do in time of tension and confusion. Being a peacemaker between two people not only teaches each child to self-reflect and reconcile - both asking and receiving it - but also to become peacemakers themselves. They see how a someone can be a peacemaker - a bridge - between two other friends, bringing them together to reconcile. So, the whole village became the classroom, the whole action was a teaching moment, and the teacher wasn't just a voice in an adult, but inside their own hearts. No one told them to go to church. The children saw the doors open and they wanted to go in. My time right now is focused on reconnecting, accompanying, and listening. each step of the way requires a listening, because we can think we know "the plan", but God is zigging while we are zagging. It's a process to learn, but it requires daily conversion, which is daily going back to the drawing board and listening again. There is a reason we ask for our "daily bread" in the Our Father - it's because a disciple of Jesus lives step by step, day by day. Each day requires coming again to God to listen. Amen, amen, I say to you, a son cannot do anything on his own, but only what he sees his father doing; for what he does, his son will do also. I will share one of the great problems here. When I first came to Chontal in 2010 I began to notice it, and it became more clear in 2011. The government was bringing the internet to the country and even the poor rural areas. The government was making a lot of changes that, in theory, would make life better, would make the country more materially developed and self-sufficient. However, it was happening in a forced and even violent way. English was being enforced, and mandated books were arriving in schools that were entirely in English, printed in the US or England. Even the teachers couldn't understand them. There was also a controlling of the time of cooking to be done: it would be illegal to use the tanks of propane gas that everyone uses in rural areas, and instead everyone would need to buy an electric conduction oven for cooking. There was no graduality in the changes, and there were no options. I believe that this causes more damage than good. And so the internet was arriving in the same way, an advanced and powerful technology that has grown up in a culture (largely the US) that has the maturity to push back, put limits, and manage it - although not always so successfully. That savvy internet technology was arriving in these simple, poor communities such as Chontal like a tsunami wave, with the capability of wiping out the community. It arrives with excitement and anticipation, but then when people start to notice that it's actually causing a lot of damage, it's too late. It finally subsides and leaves the place a mess. I decided that that would be part of my mission - not to stop the wave from coming, but to assist in building a boat, an ark if you will, to survive its arrival and subsiding. It was to accompany the people and develop a sense of community in Christ - at least with those willing, and especially with youth - that also utilizes and manages the internet technology responsibly, in service of relationships and the common good. An important part of Barriers To Bridges directly addresses this effect, as I have constantly used technology in everything I've done. But forming personal bridges between the US and Ecuador directly addresses this because it bursts the imaginary bubbles that the internet produces about life in the US and foreign "developed" countries. It brings humanity and reality into the experience of the internet. When someone from these rural places is seeing the outside world for the first time, one of the first things they are conscious of is their own poverty. It brings the message: you are lacking. It kills self-esteem, and so promote assimilation - the abandoning of authenticity, of roots, and the attempt to adopt the identity and ways of the others who are, according to one's senses, not lacking. The richer and poorer have to start becoming brothers and sisters. The rich have to share and come down, so that the poor can be raised and an equality made. The community of believers was of one heart and mind, and no one claimed that any of his possessions was his own, but they had everything in common. With great power the apostles bore witness to the resurrection of the Lord Jesus, and great favor was accorded them all. In fact, the whole concept of community "religious life" in the Catholic Church - the life of nuns and brothers and sisters and friars and monks - is originally based on this dynamic of the early church, so that that spirit of dynamic might permeate the whole life of the church. The contribution of the Church and of evangelization to the development of peoples concerns not only the struggle against material poverty and underdevelopment in the South of the world, but also concerns the North, which is prone to a moral and spiritual poverty caused by “overdevelopment.”A certain way of thinking, uninfluenced by a religious outlook and widespread in some parts of today’s world, is based on the idea that increasing wealth and the promotion of economic and technical growth is enough for people to develop on the human level. But a soulless development cannot suffice for human beings, and an excess of affluence is as harmful as excessive poverty. This is a “development model” which the North has constructed and is now spreading to the South, where a sense of religion as well as human values are in danger of being overwhelmed by a wave of consumerism. As JPII mentioned, "An excess of affluence is as harmful as an excess of poverty." The bridge is not only needed for people who are poor, but it's also needed for people in wealthy societies, especially the US. It's not that the valleys need to be raised up to the level of the mountains. As Isaiah says, the mountains need to be made low. The wealthy societies need to come down. We have to recognize that we've overdone it and left people behind, that we have to come off the treadmill of constant ambition and commercial development. There needs to be a sharing and equality that comes from true relationship, in order for God's grace to come in and to experience "the salvation of God." There needs to be an Ark. A bridge. In the early part of Jesus' ministry in Luke's Gospel, he preaches his "Sermon on the Plain" and a different form of the well-known Beatitudes in Matthew's Gospel. He is speaking not to everyone, but just to his disciples, i.e. Christians. Blessed are the poor, hungry, mourning, and rejected. Woe to the rich, full, laughing, accepted. Why are they blessed or cursed? Because it will all be flipped upside down. The point is that when God comes, He turns everything upside down. There is ultimately a justice. Mary, the mother of Jesus, in her famous prayer to God when encountering her cousin Elizabeth describes this about God. But look what happens if people had bridges and had shared and become brothers and sisters: Turning everything upside down has no effect. God's Justice can't touch a people who share and are brothers and sisters. Jesus is saying this: inasmuch as you didn't listen to John the Baptist and level up with your life, you're going to get the Justice. He wants disciples leveled up, to be real brothers and sisters. This leveling that is part of being Christian isn't just an international effect. It actually starts locally. In the family, neighborhood, church, etc. It extends to whole cities and states, countries and the world. The Christian church has organization at all these levels, reflecting the inter-relationship of them all. In B2B, I recognize this, and the focus is on local levels in a variety of locations, aiming to bridge the different levels. For example, a youth group in Quito and one in Chontal enounter one another as peers. Or a school classroom in Massachusetts encounters one in Ecuador as peers. In each case, there is a local sense of brother/sisterhood in two separate places, being linked together to form a larger sense of that community. In all of this, the Ark is being formed out of two local ones. A few years ago here, one of the very ambitious members of the community, who happened to have the keys to the church and teaches religious ed, took it upon themselves to coordinate with the internet company to place the internet receiver dish on the church steeple. She could then get internet for her business, and other homes in the village could buy internet as well. When I came and saw it, I was opposed to it, and expressed to the priest and the president of the church committee that it was not acceptable, and that the church needed to talk to the elected leadership of the whole community to transfer responsibility for a utility like internet away from the church and to the community leadership itself, where it belongs. I offered several times to the priest to help to facilitate such a meeting, but he never accepted, and nothing ever happened. With so few people using the church for prayer, and so many using it as an internet tower, it was obvious: The church was much more an internet antenna than a place of prayer. My donation to have a church built back in 2009 had been effectively transferred to the internet company. After I left, the church president contacted me some months later to say that the receiver had finally been taken off the church steeple. When I arrived again, almost 2 years ago, there was a small antenna tower now standing on the church property, which held the receivers. I wasn't happy, because the church shouldn't be involved at all in mediating internet services in any way, and it was clear that the internet company had once again taken advantage. But finally, the church president signed off on a deal with the internet company to have a free private line for the church and to pay the electric bill of the church. 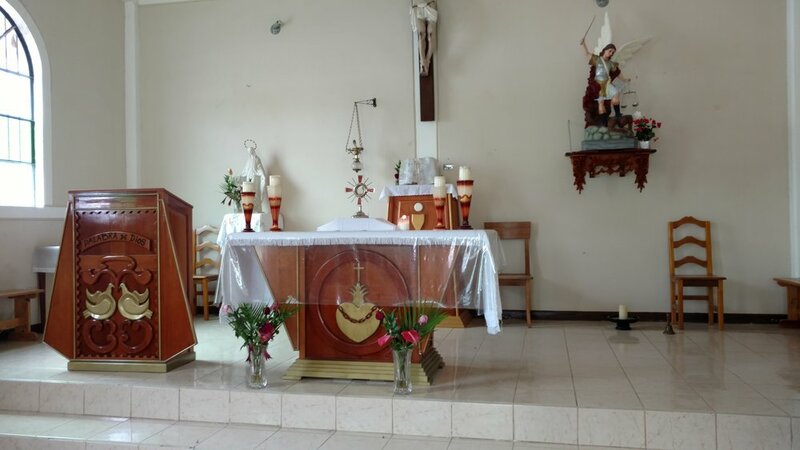 For the short time I was here with the internet working, it was set up to be for any doing ministry in the parish house or the church: teachers, priests, visitors, whomever would use it in the ministry of the church. Well, after a year and a half, I have returned. As it turns out, the background story of the internet and the church has not been shared, and all types of misinformation is going around. Seeing an antenna on church property that is a node for private accounts, people think that the church is holding a public access for itself, denying the rest of the community of free internet access. This is in part because people know about the free public access to internet that exists in the neighboring town under a very different arrangement between the government and internet company, and people here just assume that the same arrangement exists in Chontal - suppressed by the church. Furthermore, the president of the church has her daughter login for free to the church account (I had mentioned that no "perks" come with serving in the church), and different other people have had access to the church's internet. So, the appearance is that the church is controlling the public access to the internet, and sharing it with a select few favorites. Which is really true, when you consider the whole story: from the very beginning, the church got hold of something that should be "public", handled by the secular community leadership. And furthermore, I'm told that many youth have been hanging out all around the church for internet access, having gained the password from some locals who are good at hacking into routers. And even one local "businessman" was selling the password to others. Finally, as I look out the door, there are few children playing in the grassy stadium like there used to be. I ask people, where are all the kids. They all say the same thing: no one comes out anymore - they are all inside on the internet. You can see the corruption at all the different levels. You can see the tsunami blinding people to common sense and honesty and what makes for relationship and community and peace. The lust for internet access has seemed to swallow the community up. I am considering a few things, but I am putting pressure on the church leadership - the priest and the president - to approach the secular leadership and transfer responsibility of the internet and remove the antenna from church property. The church needs to apologize for its role in causing confusing and for going forward with mediating public services that it really has no role in doing. I don't know how or when they will respond with any action. I don't even know if they will. But me personally, I feel like the internet antenna has my hands tied as long as it's on church property. It is, as Jesus says, a "scandal", or obstacle, that shapes how people see the church, me, and God. And so while it's in place, it's as if the church's foundation is cracked, and it's not worth putting any effort in until the foundation is fixed. There is a great view at nighttime here as you like up from the village to the mountain alongside it. Amidst the pitch black of night, there is one light. One farmer has electricity up there on his farm. But that one light in the darkness is like a prophetic sign to the whole community every night. It reminds me of a passage from scripture that time and time again has meant a lot to me in the journey. I'm continuing to observe and reflect and listen for next steps. It's a blessing to be here. Among some ideas so far is tutoring youth in English and math, doing some music instruction for youth, working again - maybe more - on a church youth group and scripture activities, including opening up opportunities for you all to participate. But I'm not confident that things will be worthwhile until this internet issue is addressed. Please keep all here in prayer, and please feel free to comment in the comment section at the website.